A poll commissioned by STV News showed the Nationalists on 41% amongst those certain to vote, set against 37% for Labour. 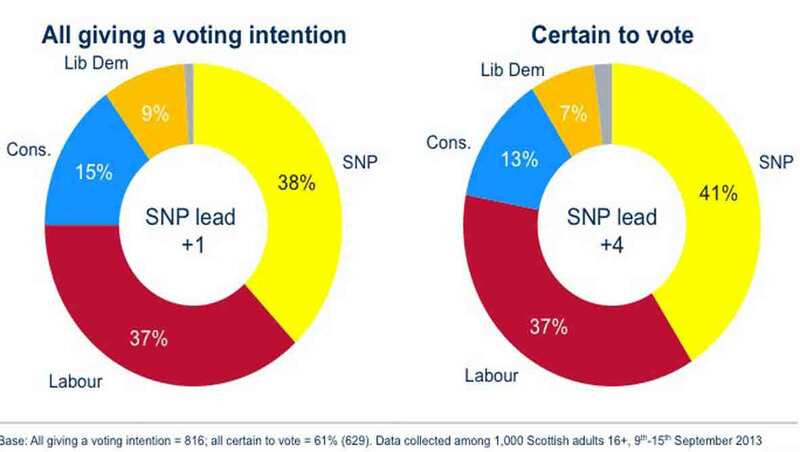 The SNP remains ahead of Scottish Labour when voters are asked which party they would vote for in the next Scottish Parliament elections. A poll commissioned by STV News showed the Nationalists on 41% amongst those certain to vote, set against 37% for Scottish Labour. 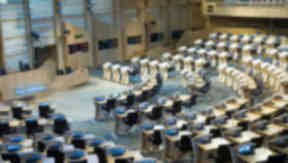 The Scottish Conservatives were the choice for 13% and the Scottish Liberal Democrats were favoured by seven percent. The findings, which were revealed by STV on Thursday, came one day after an STV-commissioned poll showed the No campaign with a 28-point lead in the referendum battle. The survey found 59% of voters intend to vote for Scotland to remain in the United Kingdom while 31% intend to vote for independence. A further ten percent of voters remained undecided. The Holyrood poll, conducted by Ipsos Mori, asked 1000 Scottish adults how they would use their constituency vote "if there were elections to the Scottish Parliament tomorrow". The next Holyrood vote will be held in May 2016, regardless of whether Scotland is still in the union or is by that point an independent country. Set against the constituency results from the 2011 Holyrood election, the poll suggests a dip in support for the SNP, which polled 45.4% at the last election; an increase in support for Scottish Labour, which took 31.7% before; and a dip of almost one percent each for the Scottish Conservatives and the Scottish Lib Dems, who won 13.9% and 7.9% respectively in 2011. Voters were also asked how satisfied they were with key leaders in Scottish and UK politics. The results put Alex Salmond ahead of all the other Scottish party leaders plus the Prime Minister. Forty-eight percent of voters are satisfied with the First Minister's job performance, while 40% are dissatisfied and 12% do not not know. 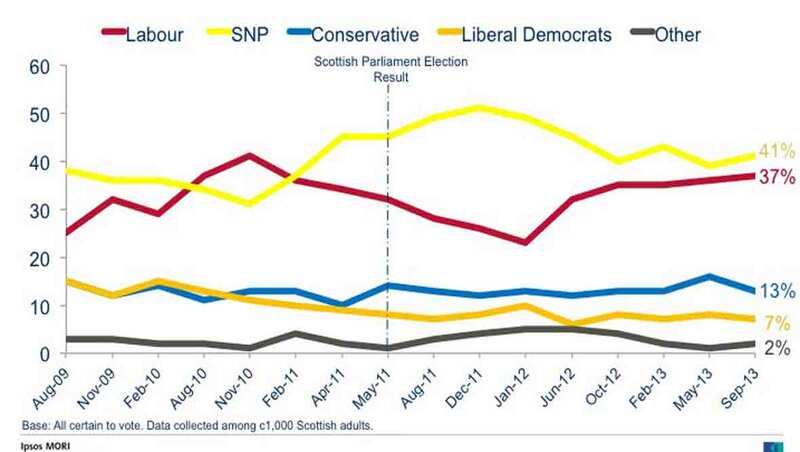 Scottish Labour leader Johann Lamont came second with 37% of voters satisfied, 31% dissatisfied and 32% not knowing. For Scottish Conservative leader Ruth Davidson, voters were tied: 31% said they were satisfied, 31% dissatisfied and 38% did not know. Patrick Harvie, co-convenor of the Scottish Greens, recorded 27% for satisfied voters, 16% for dissatisfied voters and 58% who did not know. Scottish Lib Dem leader Willie Rennie's job performance has satisfied 22% of voters and dissatisfied 27%, while 50% did not know either way. The most unpopular political figure was David Cameron, with the Prime Minister garnering almost twice as many dissatisfaction ratings (60%) as satisfaction ratings (32%). Only eight percent of respondents did not give an opinion. However, Mr Cameron's fortunes were reversed when the samples were restricted to party supporters. Eighty-one percent of Scottish Conservative supporters approve of the Prime Minister's job performance, with 15% disapproving and only four percent saying they did not know. Mr Salmond was a close second, with 78% of SNP supporters satisfied with the job he is doing, against 14% who said they were dissatisfied and eight percent who gave no opinion. Ms Lamont's performance was backed by 58% of Scottish Labour supporters but not by another 19%, while 23% were undecided. Fifty-seven percent of Scottish Conservative supporters described themselves as satisfied with Ms Davidson's job performance, while 18% disapproved and 25% did not know. 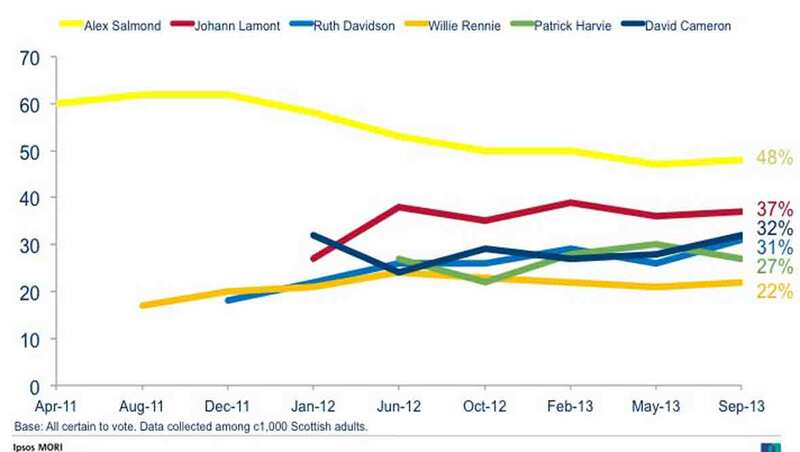 Mr Rennie received a satisfactory rating from 57% of Scottish Lib Dem supporters. On the other hand, 13% were unhappy with his performance and 30% did not give an answer.